When we moved into our new house this past summer I was so excited to have more space and new rooms to decorate. But when it comes to a full room make over and decorating I could use a little help. 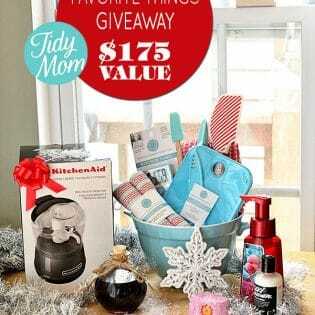 There are some wickedly talented home bloggers who can do this stuff in their sleep. Jess is used to being the one in charge, so I’m going to let her take it from here……………. Hi everyone! 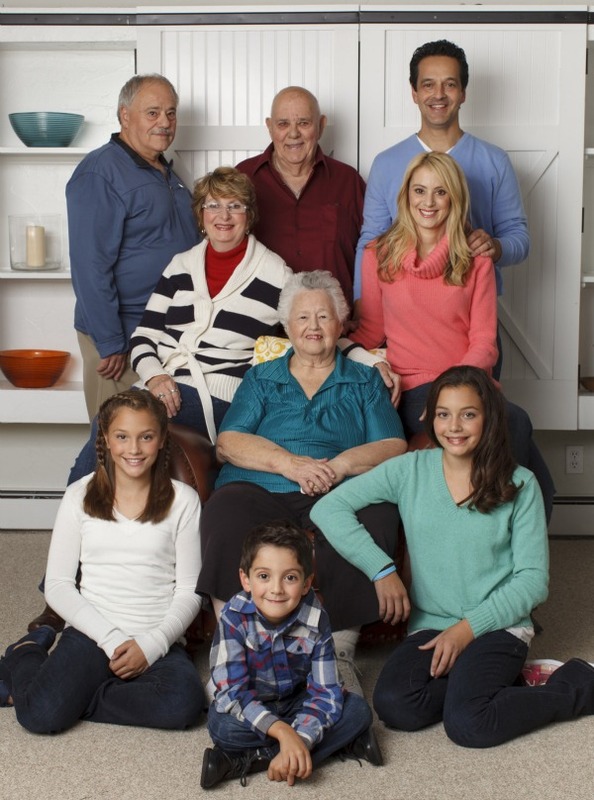 I am Jessica from Four Generations One Roof. I was thrilled when Cheryl asked me if I wanted to collaborate with her on her “new” family room makeover. Honestly, I was kind of flattered. I told her she might regret getting me involved as we DIY everything in our home. She said, “my husband might regret it but not me!” So lets get started shall we? As I’m sure most of you know, Cheryl and her family moved into this home just before the summer. Cheryl purchased these beautiful tufted sofa’s that were in her previous home and they now fit nicely in this corner. The walls are a dark beige that were painted by the previous home owner. Cheryl agrees that the room needs to be lightened up and the quickest way to do that is with a fresh coat of paint. The first thing I asked Cheryl was, “is your husband handy, like, can he swing a hammer?” She said, “oh yes!” That was all I needed to know! 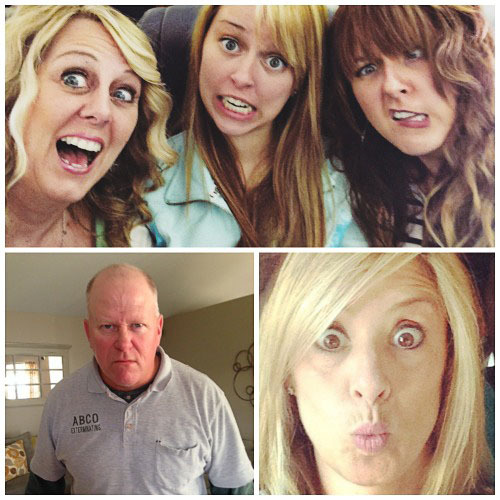 Meet Steve, Cheryl’s cute husband. The poor man has no idea what he got himself into……. 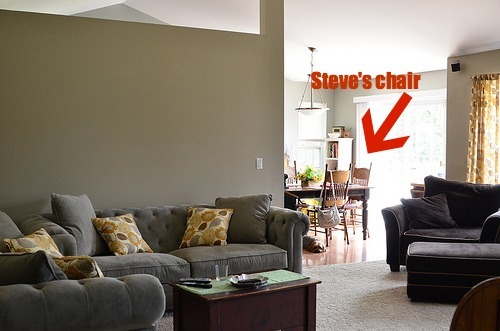 Oh poor Steve, you really do have your work cut out for you painting this room. Cheryl has decided that the chair in front of the fireplace is to large for the area so she is on the hunt for something smaller that coordinates with her new tufted sofas. Chaaaaa-ching Steve :). So here is what we are thinking. 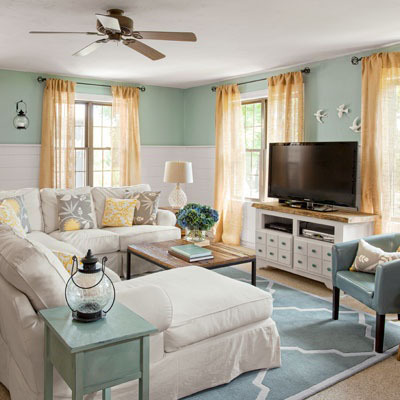 Cheryl loves aqua blues, coral, and eclectic mixes with a hint of coastal. She loves the beach but doesn’t want the overall theme to be “beachy” if that makes any sense. 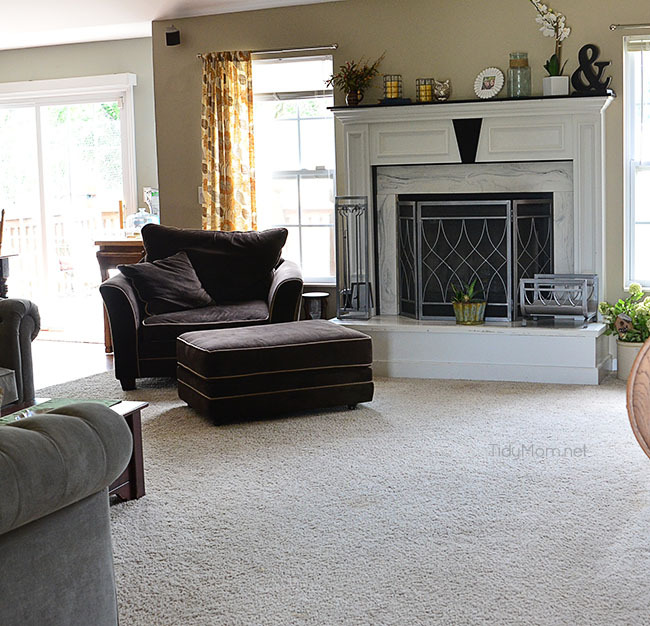 A clean crisp room with warm toned elements to create an elegant casual space is what Cheryl is hoping to achieve. We both have been pinning inspirational pictures to the “family room ideas” pinterest board for a few weeks. 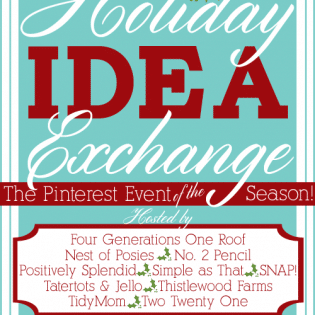 Gathering ideas and inspiration on pinterest is a great way to get organized and figure out what you really love. 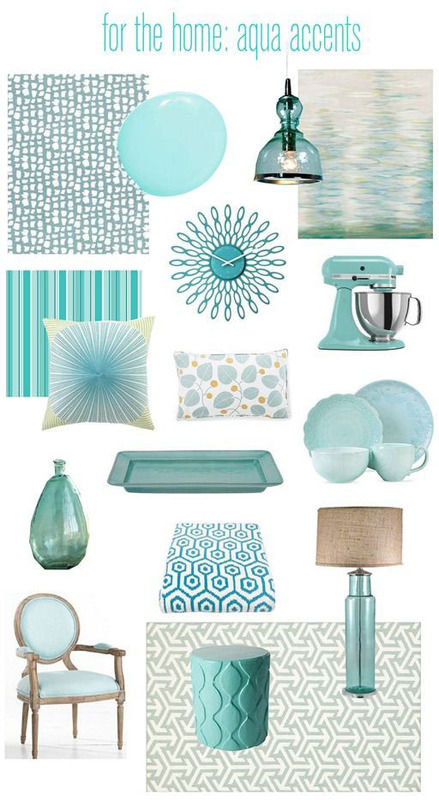 Kate from Centsational Girl put together this aqua color pallet that Cheryl loves. 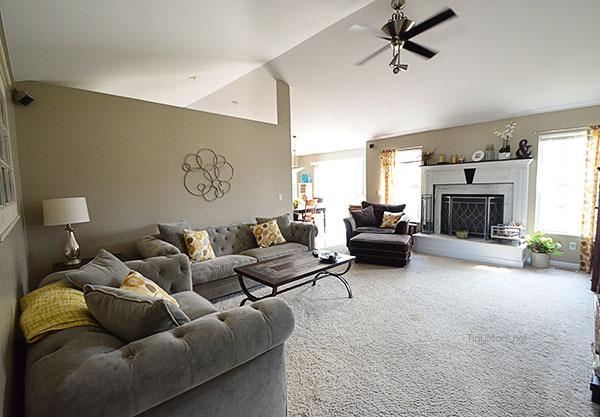 This is my family room that we created over a year ago. Our original family room was dark and dated providing a very boring space to hang out in. I added wide pine planks to the wall which completely changed the look of the room. The room is very large and lacked in character and the planks added the sense of coziness that was needed. Cheryl loves the idea of a wooden wall treatment and the white/blue/green/tan color tones. This next color pallet has an overall darker theme but still in the blue color family. Cheryl’s couches are a steel gray color so mixing in yellow for accents would be pretty. Oh and Cheryl found a very similar styled rustic coffee table that she has decided to purchase as well. Eeeek Steve, it’s never a good thing to get me involved. I love helping spend other peoples money! 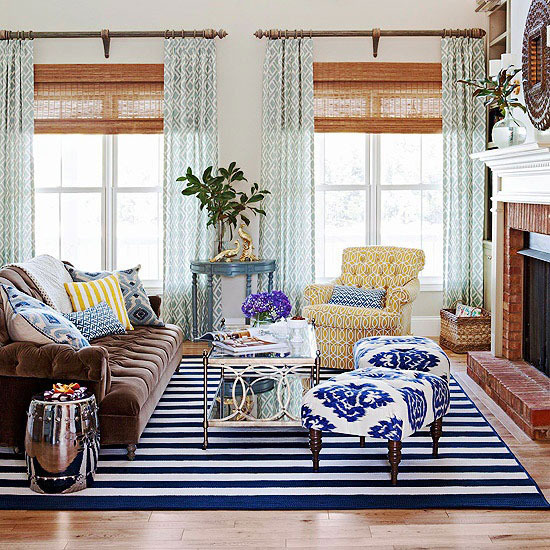 What I love about this space is the mixing and matching of colors and patterns. Cheryl found this mood board created by Ashley at the Handmade Home that features pops of bright colors while still using gray and blue. 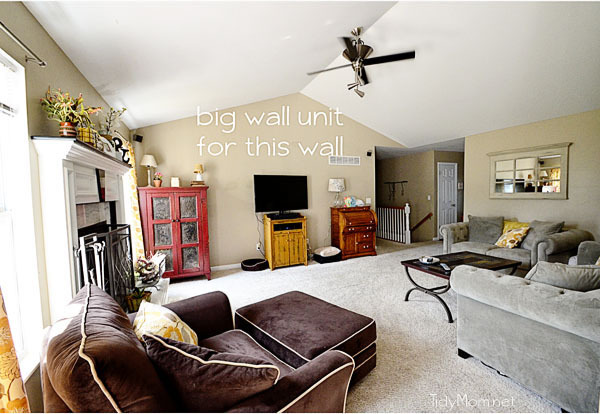 On the large wall where the television is, Cheryl is also planning to purchase a media center that will be conducive to the size of the wall and perfect for housing the tv, kids games, toys and other media components. 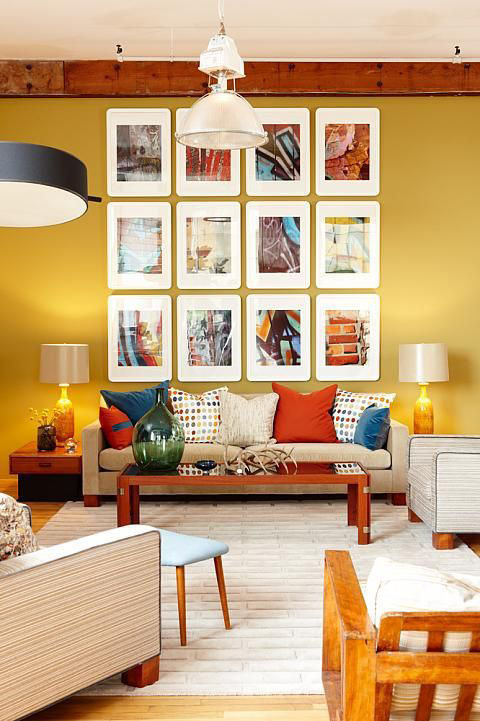 Depending on what type of media center she purchases, something similar to these gold étagères coordinated with textured wall paper would be beautiful on that wall. 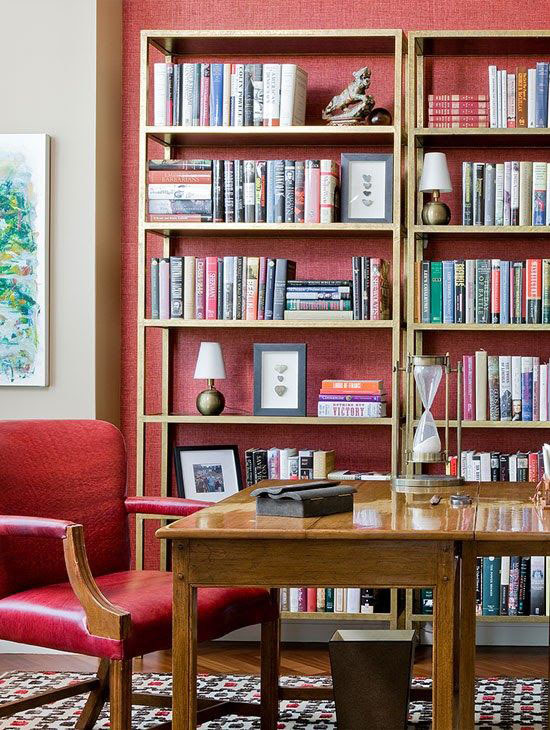 They offer the height necessary for such a large wall and are perfect for books, storage baskets and design accessories. 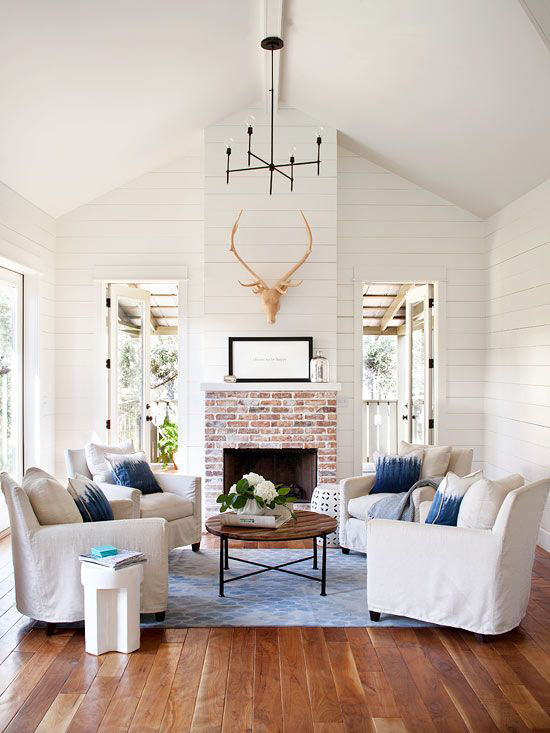 I love the idea of adding wide pine planks to the wall or some sort of wall treatment. Personally, I think it will cozy up the room and add some character to the large space. This room below is very similar to Cheryl’s fireplace wall flanked by floor to ceiling windows. I think a plank wall treatment on top of the mantel finished with 5 inch crown molding would be perfect! Don’t you? 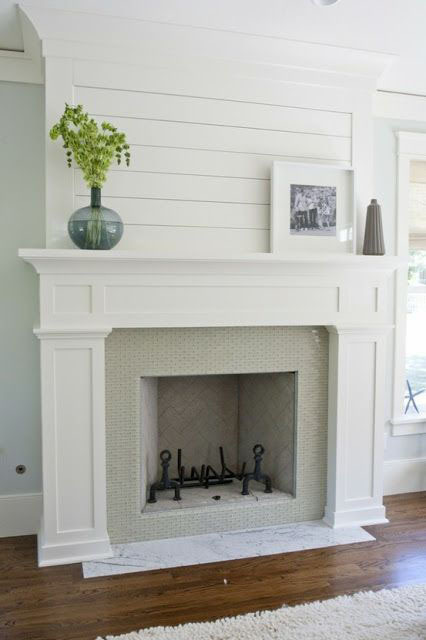 Here is another example of what a wall treatment will do for a fireplace. 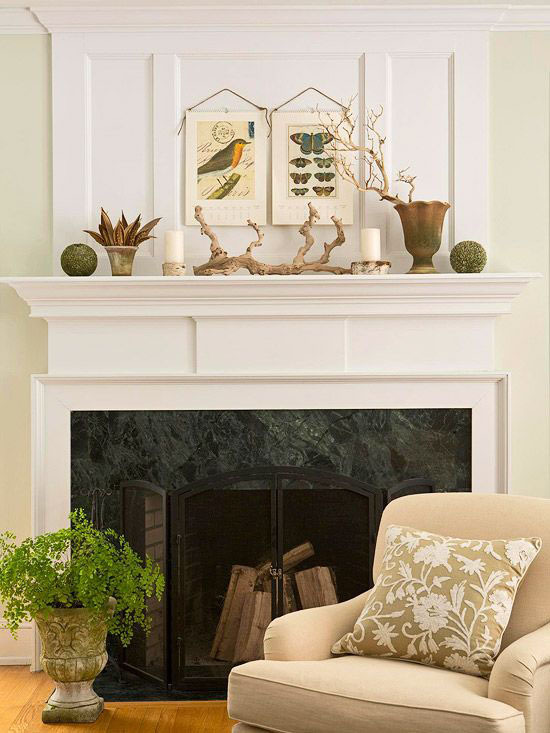 It takes a fireplace and turns it into a custom design piece. A focal point for the wall. Do you agree? 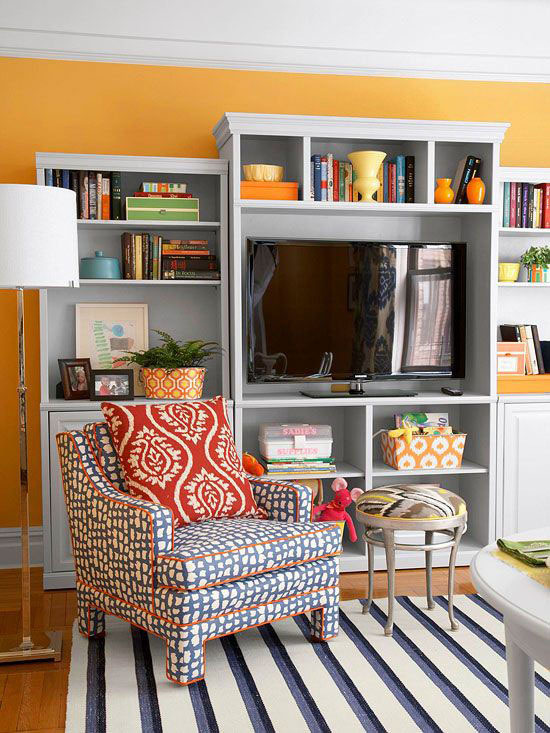 The television wall is the largest wall in the room and in order to make the room look collected and in sync with the rest of the elements in the room, the media center needs to take center stage. Something similar to the media center below would fit nicely along that wall. Both open and closed door storage will offer a display area for pretty decorative items while the closed door cabinets can hide toys and games. Steve, if you can pull this off, you would be known as the rockstar husband of 2013 in the blogosphere. A full room of planks. Oh my. A gallery wall above the couches would be a great focal point for the seating area and again, the walls are very high so something like the wall gallery below would be suitable. We will be back periodically sharing ideas, color schemes and Steve’s progress! Remember Steve in the beginning? So happy and cute? He said to Cheryl, “who is this girl Jessica? She needs to go away!” hehe That’s what my dad and husband always say about me and DIY projects. There is nothing wrong with dreaming big, right? 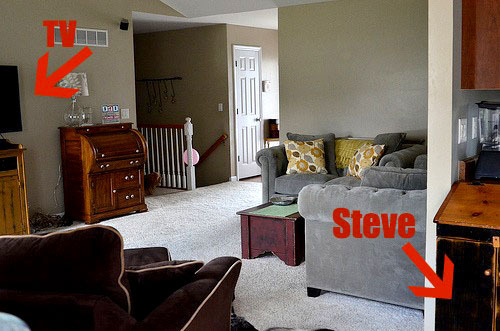 The family room makeover at the “Tidymom” household is about to under-go a dramatic makeover. Cheryl and her kiddo’s are super excited to see “dad” at work. Thanks so much for all your input Jess!!! We are picking out a paint color for the walls right now, and we are ready to get started on this! I’ll keep you all posted as we go! I’d love to hear any thought anyone has, feel free to leave them in the comments! Can’t wait to see the finished product! So fun! So freakin’ cute!! I cannot wait to see the final transformation! Enjoy the process! 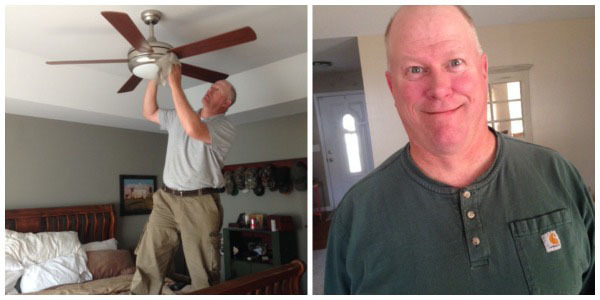 And… be extra nice to your handy-guy! In fact… I think he needs a cake, STAT!! I would put that chair in the corner on the other side of the fireplace. I would not put a huge wall unit around the tv but purchase a console cabinet and mount the tv over that. Wall units with doors tend to never have doors closed. Then you would be able to put pretty lamps and maybe a bowl on the console. I would definitely want the console as tall as possible. How fun!! I can’t wait to see how it all turns out!! What fabulous design ideas! I can’t wait to see the finished room! How exciting! oh what fun I am looking forward to all the step by step stuff that goes on. love your colors too. I can’t wait to see what you girls come up with. Going to be awesome I bet. sure looks like so PRETTY-PRETTY inspirations, love all those colors! Such great ideas, I want some of those gold étagères for my home now! Oh fun!! 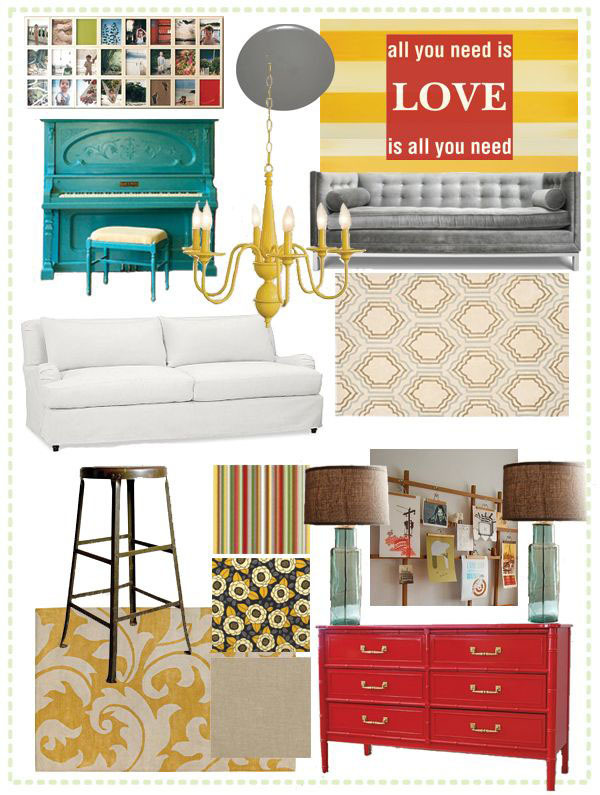 I did an inspiration board for my new living room with the same colors. I posted about it while ago. Love that blue. Cracking up at the Steve photos! LOL Can’t wait to see how the room turns out. Looks like you might have a lot of work ahead — but it will look beautiful. Love the inspiration Jess has given you too! Ohhhh I am so excited about this. It is going to be so gorgeous!!! I suddenly find myself wishing I had a room to decorate! How fun! I love her! Can’t wait to see the final results! Great ideas there! I am struggling with my family room right now too!! I am not so great the final putting together stages! I adore the color palate- that aqua is very soothing and cool. Colors can change so much about a room. Can’t wait to see it when it’s done. And Steve’s reaction was priceless! That’s about how my husband would be, too! Okay this is SO fun!!! Thanks for using our mood board to help with the design of your space! Can’t wait to see the final look!